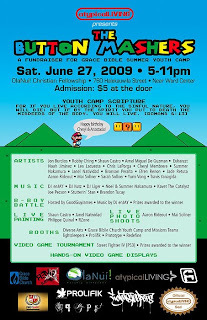 atypicalLIVING and Grace Bible Church Pearlside Youth Ministries, in association with OlaNui!, present The Button Mashers, a benefit art show for Grace Bible’s Youth Camp this Summer. This event will feature multimedia art displays, live music, a live art mural painting featuring Shaun Castro, Janel Natividad, Philippe Anthony Quinal & RZone, a BBoy Battle, a Street Fighter IV Tournament, and interactive, hands-on video game displays. This all goes down Saturday, June 27th, at OlaNui! Christian Fellowship, 760 Halekauwila Street, next to Logos Bookstore & near Ward Center. All proceeds to benefit Grace Bible’s Summer Youth Camp. Big UPS to Grace Bible Church, OlaNui!, Redefine, lightsleepers, prolifik, Prototype, First Lady The Movement, Liberty Peralta, Yumi Vong & Mike Ulep. Get Ready… awesome is imminent.